With spring on the way, it’s important to remember that nasty parasites like fleas will be more abundant as the weather warms up. One female flea can lay up to 50 eggs per day. The majority of fleas live in the environment such as the car, furniture and flooring (carpets and hard floors) and jump onto your pet to feed. We stock a wide range of flea treatments to suit every lifestyle. Central heating and lighting indoors during the winter provides an artificial breeding environment for fleas. Pets that didn’t receive regular flea treatments during the winter months can be more prone to a heavy flea burden this time of year. As part of our healthy pet club you will receive monthly flea treatment as well as many other benefits. Please get in touch if you would like more advice or to find the best product for your pet’s lifestyle. An adult flea is a little brown wingless parasite up to 3mm long. They can move very fast and jump huge distances relative to their size. Adult fleas jump onto the host (e.g. cat, dog or human) and within minutes will begin feeding on the host’s blood. In less than 48 hours, female fleas begin laying eggs which fall off the animal into the environment – wherever the host happens to be at the time. A single female can lay up to 50 eggs a day! That means in one month, an unprotected pet with just 10 fleas, can give rise to 15,000 eggs! In a few days these eggs hatch into larvae (like tiny maggots), they dislike light and immediately crawl away deep into carpets and cracks in floors. The flea larvae feed on organic debris in the environment but also the faeces of the adult fleas (this is basically the digested blood of the host). The larvae will feed for 1-2 weeks before turning into a hard shelled pupa. These pupae may lie dormant for weeks or months. When the environmental condition is right, they hatch into adults and start the whole cycle over again. Depending on temperature, the life cycle can last as little as 2-3 weeks or as long as several months. 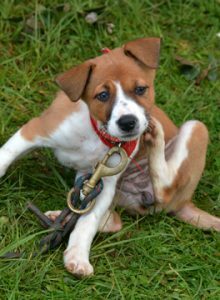 Scratching – most dogs and cats will scratch themselves a lot if they have fleas. Loss of hair especially on the back. Both cats and dogs will show hair loss on their back and around the base of the tail. The hair often looks broken and spiky. Cats often go bald on their tummies. Skin becomes lumpy or scabby on the back or around the neck (especially in cats). Fleas are visible to the naked eye being up to 3mm long, so therefore you may see them. Flea dirt is the faeces of the flea. It looks like black soot, but if you put a bit on a wet white tissue or cotton wool, it will turn red as it is digested blood. There are many species of flea but they’re not fussy who they jump onto. Please talk to us about how to effectively treat and prevent fleas!